Manila Ocean Park has changed a lot since the last time I visited. The single showing Oceanarium viewing has evolved into several other shows. These are grouped into different packages you can choose from. See photo below for packages and corresponding prices. 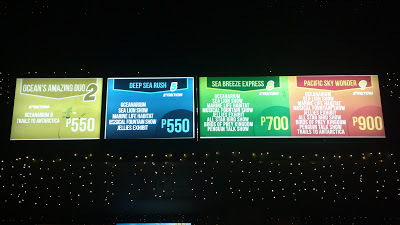 Since we started the tour late (early evening), there were only two options left and we have selected the package which included Oceanarium and Trails to Antartica. The former still offered the same ocean park with various schools of fishes on display on small aquariums and the main one. Trails to Antartica on the other hand allow you to experience the chilling weather up north. You will be provided with a winter jacket for protection from the cold temperature inside the trail. Outside, several penguins freely roam the icy enclosed temporary habitat. On the upper floor, the same souvenir shop is available. Roam around and you’ll find restaurants and tiangge shops going down through the stairs. You might get lost through exits everywhere so be careful where you enter. Ocean Park now has a hotel as well called H20. 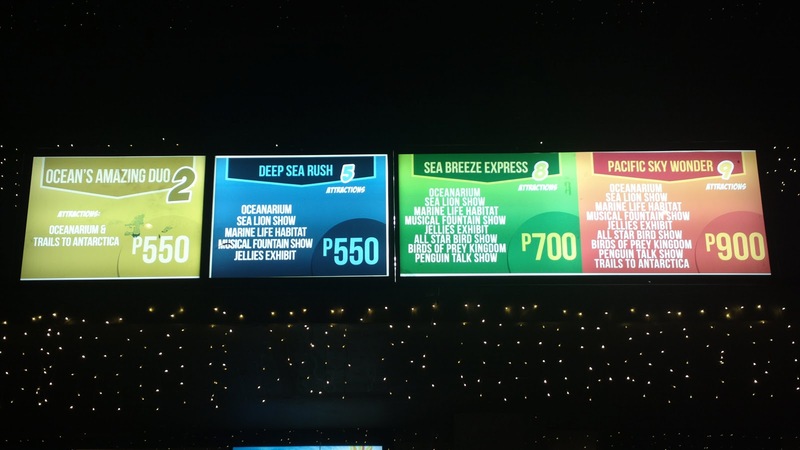 Changes actually makes Manila Ocean Park more fun and enjoyable than ever. So if you intend to visit, make sure to start early and avail of packages filled with as many tours and activities as possible.